Hurricanes Katrina and Rita stole more than 200 square miles of coastal wetlands from Louisiana. Over the past 80 years, hurricanes and the human harnessing of the Mississippi River have destroyed enough marshland to cover the state of Delaware. This week Louisiana adopted a plan that will make $224 million available for coastal restoration projects. It's part of a "Master Plan" to protect people, business, and wildlife habitat from coastal loss– while at the same time strengthening hurricane protection. "New Orleans is an interesting place to be now. It is dawning on the community that the cavalry is not going to show up with the big answers," said Mark Davis, director of the Institute on Water Resources Law and Policy at Tulane University Law School. Davis said the post-Katrina realization that government did not have all the answers has prompted some energetic self- sufficiency. "The healthiest part of this is the desire for honest information, honest answers, and that's from business and civic organizations as well as the most grass roots neighborhood organizations," he said. "The strength right now of this community is that it is optimistic." Davis said he is excited by the really creative people who have come to New Orleans. "This is the place to be to do good," he said. And if they are successful, other coastal communities may then learn about everything from insurance issues, to sea level rise from global warming, to land use planning. One key to bringing the delta back to life is to allow the sediments and nutrients flowing down the Mississippi River to recharge the state's wetlands and barrier islands. "We have to give the coastal wetlands a fighting chance," said Professor Denise Reed, an expert on coastal marshes at the University of New Orleans. "That we have such extensive wetlands is testament to their strength," said Reed, who has been working on the development of restoration plans for coastal Louisiana for the past five years. Reed says humans have put the Mississippi River in a "straitjacket" with levees and other alterations, preventing it from building up land. One recent action that may help the Mississippi return to its role as a nurturer of the marshes and estuaries is the impending closing of the Mississippi River Gulf Outlet. 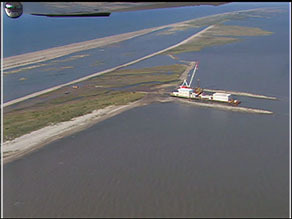 Known as "Mr. Go," the 1960s Army Corps of Engineers project to improve ship navigation has been blamed for speeding up the loss of wetlands, and even for amplifying the effects of the storm surge from Hurricane Katrina. While a rebirth of the wetlands could take decades, Davis said there is plenty that can be done now. "You can begin to make people safer sooner if you make sure you're not building in harms way; and not encouraging building techniques that are more vulnerable to storm risk." People didn't realize how much the wetlands protected New Orleans from horrific storms until those wetlands were degraded and the city felt the full impact of Hurricanes Rita and Katrina. The only way to restore that protection is to allow and encourage the complete restoration of the wetlands. Compromising on this issue would mean compromising on providing the region with as much natural storm protection as can be made available, and will leave the residents at risk. The issue is not politics, and it's not business – it's public safety, pure and simple. All these weather-related disasters are part of the Global Elite's agenda. The restoration of coastlands should be a priority not only for Louisiana but the nation. Do you realize how much oil is retrieved off the coast of Louisiana but yet how little is actually filtered to the state. To paraphrase a writer, It was once said that if taxes owed by the US Government were paid to Louisiana, then each person in the state would drive a BENTLEY! Coastal restoration should be a priority for the nation and Louisiana needs to take a lead with assistance from the US Government. Let it revert back to a rich farming area. Food and biofuel prices rising, providing the incentive. Safety similar to Cyclone walls and shelters in Bangladesh. Improve structures to survive the 30 foot surges. Louisiana's coast is the Gulf of Mexico so it won't be getting an Atlantic tsunami. This loss didn't occur overnight and won't be corrected overnight either. It needs a long term care. As an ex-Louisiana resident, I don't think that it can be done due to the massive amount of corruption in the state/local governments there which was the main reason for the levee failure during Katrina. Instead of letting the sediment build up to form a fertile river delta. Without dredging, the river becomes shallower, depositing in low areas. How soon before noticeable new land formation ? No way, The city has to be relocated, in an environmentally supportive manner. Building codes and safety measures, at least as eco friendly as Bangledash. Why keep destroying a high potential farming delta ? The jazz musicians can play on paddle wheelers for a while. There is no comparison between Lousiana and Bangladesh. The number of people living near the cost is less than 1/10 of 1%. In addition, a tsunami brings water in the form of waves but then the water leaves again because the height of the sea returns to normal after the waves have landed. A hurricane brings the water in hundreds of miles for days as a giant bubble and when it drains all of the water in the bubble stays for several days before bubble diminishes. This causes the water to drain s l o w l y. The Misissippi River Gulf Outlet (Mr. Go) was a high speed interstate for the 25 foot surge of water that the hurricane brought. The Mr. Go is the entire reason ALL structures in St. Bernard parish were damaged. I have video clearly showing that the wind only caused some damaged. The 12 feet of flood waters from the Mr. Go that arrived at 8:05 am and reached their peak by 9:00 am. The waters then had nowhere to go and took 3 weeks to subside. Franko is right. The guy from Brooklan is odd. Trying to slavage a city was never smart when it is however many feet below sea level that NO is. The port is more important. Note that there never was any intent to rebuild the city, just Bushie lip service. The folks most impacted were poor and balck, both major sins in the GOP. Much better to leave the area in ruins and some poin the Government will take the property for taxes and the fat cats delevopers will have their field day. Even better for the corrupt cronies, the taxpayer forked out a huge amount of money and like Iraq, it disappears without accountablity. Very tall plexiglass enclosure around nightclubs and historical sites. Jazz Music in the background ? The port, dredged, but not directly on the river. Have your cake and eat it 4 times over. And the taxman will eat it several times more !